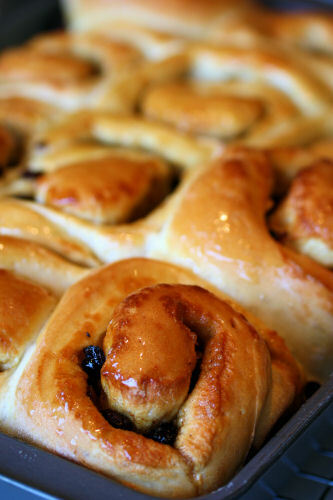 Chelsea buns are a type of currant bun made with a rich yeast dough. 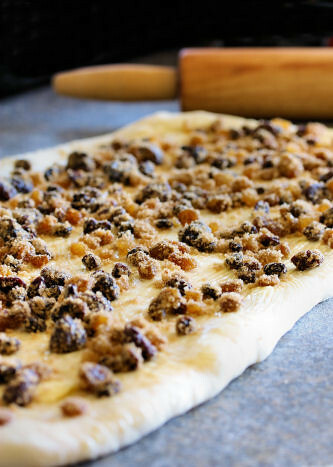 The dough is rolled out into a rectangle and covered with sugar and dried fruits. It's rolled up, left to rise and then baked. A sweet glaze is the finishing touch. You can find them in all British bakeries, but the ones you make at home are the best - you know exactly what goes into them and you can eat them as soon as they are baked. Put the yeast, strong bread flour, sugar, salt, unsalted butter and the egg/milk mixture into your bread machine in the correct order. Use the dough setting and keep an eye on the mixture, you may need a little more or less milk to make a smooth, soft dough. When the dough is ready, roll it out onto a floured surface in a rectangle shape approx 35cm x 25cm. Mix the dried fruit, mixed peel and the soft brown sugar together in a small bowl. Brush the surface of the dough with the melted butter and spread the fruit mixture on top to within 2cm of the longer edges. Roll the dough from the long edge and press to seal the edges. Cut into slices about 3½cm wide and put them in a large baking tin. Leave to rise until doubled in size. Heat the oven to 180ºC and bake for about 25-30 minutes. Turn the buns out onto a wire wrack and brush with honey while still warm. 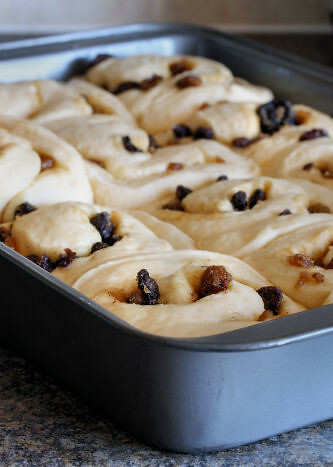 Your Chelsea buns look like the real deal!! Sweet & so appetizing looking! Yum yum yum yum yum!! 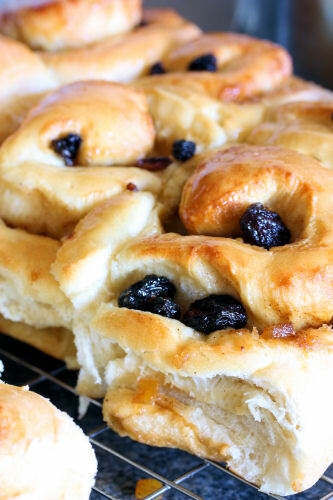 I LOVE Chelsea buns and these look just perfect. The photo is making my mouth water! I love pastries and these look so good. It's really hard to buy good ones, but I'm so lazy about making this sort of thing - I'll just have to imagine I've eaten one of yours and now feeling replete and satisfied! Nic, this is deliciously tempting ! YUM! Totally agree that everything is so much better homecooked, and you have the benefit of knowning exactly what's in them, and of course eating them straight from the oven! They look fantastic. Your pictures have made me crave one warm from the oven right now lol. Going to have to add these to my must make list! I love all kinds of sweet rolls, and these look fantastic. The honey topping is lovely. They look lovely, I can just imagine one warm from the oven for breakfast! Nic your photos are amazing - I don't even like cakes or buns but you always make me want to eat them!! Those buns look seriously good. Your Chelsea Buns look perfect Nic. Love these currant buns' I can taste 'em now. what is it about these buns that I admire them so much when others - such as yourself - make them but I can't bring myself to make them - it is not for lack of desire! Wow oh wow, those Chelsea Buns are the business!! blimey Nic, you sure know how to bake! yummy!!! 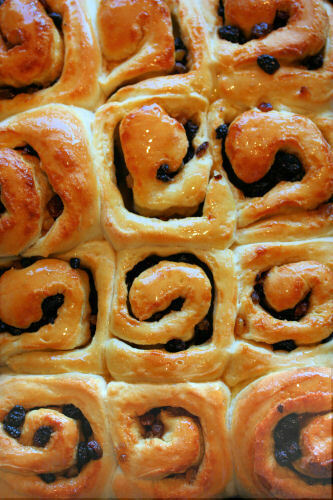 your Chelsea buns are sooo mouthwatering!!! O.K. About how many cups is 600 gm of flour? I guess, I'm just a lazy American with no calculating skills. The rolls look great. Lee - your best bet is to google some conversion sites for a flour in cups to grams conversion. Next time I'm measuring flour I'll pop it into cups and see how many I get.